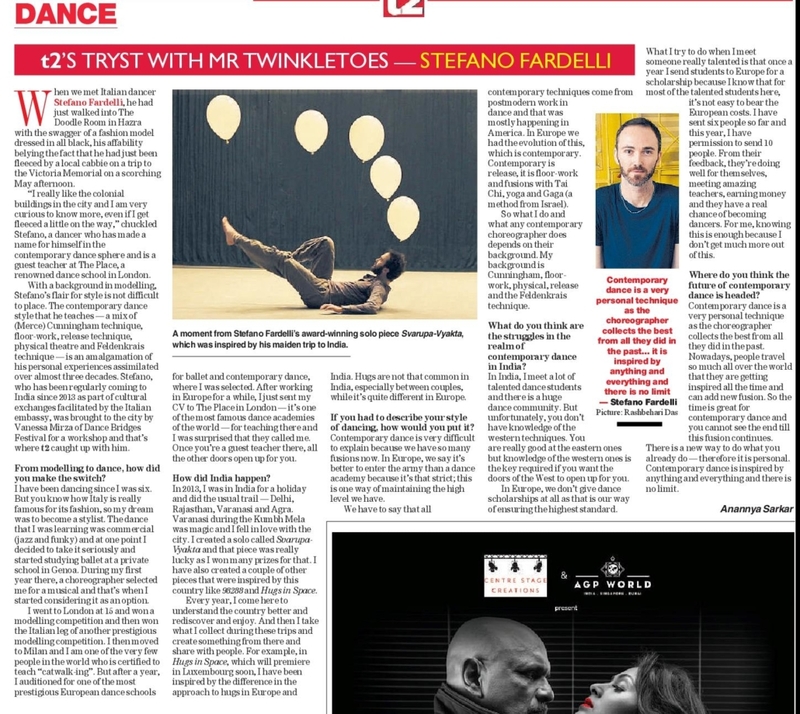 Artist interview with Stefano Fardelli for The Telegraph t2 by Anannya Sarkar. Read the article online here. When we met Italian dancer Stefano Fardelli, he had just walked into The Doodle Room in Hazra with the swagger of a fashion model dressed in all black, his affability belying the fact that he had just been fleeced by a local cabbie on a trip to the Victoria Memorial on a scorching May afternoon. “I really like the colonial buildings in the city and I am very curious to know more, even if I get fleeced a little on the way,” chuckled Stefano, a dancer who has made a name for himself in the contemporary dance sphere and is a guest teacher at The Place, a renowned dance school in London. With a background in modelling, Stefano’s flair for style is not difficult to place. The contemporary dance style that he teaches — a mix of (Merce) Cunningham technique, floor-work, release technique, physical theatre and Feldenkrais technique — is an amalgamation of his personal experiences assimilated over almost three decades. Stefano, who has been regularly coming to India since 2013 as part of cultural exchanges facilitated by the Italian embassy, was brought to the city by Vanessa Mirza of Dance Bridges Festival for a workshop and that’s where t2 caught up with him. From modelling to dance, how did you make the switch? I have been dancing since I was six. But you know how Italy is really famous for its fashion, so my dream was to become a stylist. The dance that I was learning was commercial (jazz and funky) and at one point I decided to take it seriously and started studying ballet at a private school in Genoa. During my first year there, a choreographer selected me for a musical and that’s when I started considering it as an option. I went to London at 15 and won a modelling competition and then won the Italian leg of another prestigious modelling competition. I then moved to Milan and I am one of the very few people in the world who is certified to teach “catwalk-ing”. But after a year, I auditioned for one of the most prestigious European dance schools for ballet and contemporary dance, where I was selected. After working in Europe for a while, I just sent my CV to The Place in London — it’s one of the most famous dance academies of the world — for teaching there and I was surprised that they called me. Once you’re a guest teacher there, all the other doors open up for you. In 2013, I was in India for a holiday and did the usual trail — Delhi, Rajasthan, Varanasi and Agra. Varanasi during the Kumbh Mela was magic and I fell in love with the city. I created a solo called Svarupa-Vyakta and that piece was really lucky as I won many prizes for that. I have also created a couple of other pieces that were inspired by this country like 98288 and Hugs in Space. Every year, I come here to understand the country better and rediscover and enjoy. And then I take what I collect during these trips and create something from there and share with people. For example, in Hugs in Space, which will premiere in Luxembourg soon, I have been inspired by the difference in the approach to hugs in Europe and India. Hugs are not that common in India, especially between couples, while it’s quite different in Europe. If you had to describe your style of dancing, how would you put it? Contemporary dance is very difficult to explain because we have so many fusions now. In Europe, we say it’s better to enter the army than a dance academy because it’s that strict; this is one way of maintaining the high level we have. We have to say that all contemporary techniques come from postmodern work in dance and that was mostly happening in America. In Europe we had the evolution of this, which is contemporary. Contemporary is release, it is floor-work and fusions with Tai Chi, yoga and Gaga (a method from Israel). So what I do and what any contemporary choreographer does depends on their background. My background is Cunningham, floor-work, physical, release and the Feldenkrais technique. What do you think are the struggles in the realm of contemporary dance in India? In India, I meet a lot of talented dance students and there is a huge dance community. But unfortunately, you don’t have knowledge of the western techniques. You are really good at the eastern ones but knowledge of the western ones is the key required if you want the doors of the West to open up for you. In Europe, we don’t give dance scholarships at all as that is our way of ensuring the highest standard. What I try to do when I meet someone really talented is that once a year I send students to Europe for a scholarship because I know that for most of the talented students here, it’s not easy to bear the European costs. I have sent six people so far and this year, I have permission to send 10 people. From their feedback, they’re doing well for themselves, meeting amazing teachers, earning money and they have a real chance of becoming dancers. For me, knowing this is enough because I don’t get much more out of this. Where do you think the future of contemporary dance is headed? Contemporary dance is a very personal technique as the choreographer collects the best from all they did in the past. Nowadays, people travel so much all over the world that they are getting inspired all the time and can add new fusion. So the time is great for contemporary dance and you cannot see the end till this fusion continues. There is a new way to do what you already do — therefore it is personal. Contemporary dance is inspired by anything and everything and there is no limit.